Regular grooming is crucial to your dog. But it is not necessarily limited to just normal cutting the fur short, trimming, brushing, etc. Just like humans, dogs can have various hairstyles that make them appear neater and more fashionable. Usually, dog owners tend to have professionals groom their dogs and finish with some certain styles. However, the cost of regular professional grooming sessions are way too unaffordable for some owners. Being unable to afford long-term professional grooming services, in fact, do not restrain us from giving our lovely friends desirable hairstyles our own. There are many hairstyles that can be easily done at home by dog owners, with no expertise needed. So let’s scroll through some options. As you may tell from its name, this is one of the most basic dog hairstyles that is commonly selected by dog owners. For this style, using a dog clipper, we just trim slightly all the areas such as the feet, sanitary areas, back of the legs, neck, and chest, and so on. Honestly saying, there is nothing too special about this hairstyle. The ultimate goal is to keep the trimming simple, while giving the dog a clean and neat haircut. 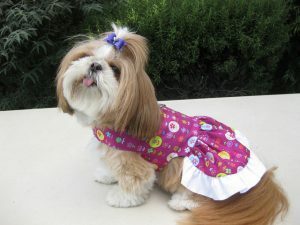 This style is suitable for most breeds, especially for double-coated dog breeds such as golden retriever, akita, husky, etc. In fact, double-coated dog breeds are highly recommended to have this style of haircut because as their two layers of coat together create a natural mechanism to protect them from external harmful factors, shaving their coats to create desirable styles will actually interfere with this natural protecting mechanism and harm your dog. For double coated dogs, the topcoat is comprised of tougher hair acting as a safeguard to protect them from the sun and bug bites. Therefore, while you think it is a good idea to shave or trim their hair to keep them cool in summer, it does more harm than good. So, in case you have a double-coated dog or you just want to give your dog a normal clean and neat look, pick this style. If you have seen a lamb before, probably you can somehow picture this style in your mind before we talk about it. And yes, this style is inspired by lambs. For this style, the hair on the legs and head are left longer, while hair on the body and neck is clipped short. Leaving the hair on legs and head longer and other parts shorter creates an illusion that your dog looks fluffier. The fluffy legs make them look like the lambs, and that is why this hairstyle is names “the lamb cut”. 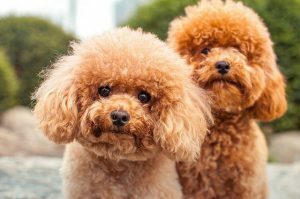 Although this style is not specific to any breed, some certain breeds are more suitable for this style, such as poodles. 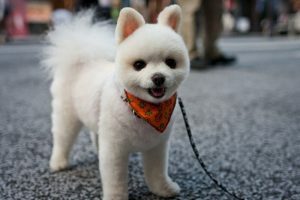 Additionally, dogs with white coat look extremely adorable with “lamb cut” hairstyle. Well, you may start to notice how they name the styles. If you are thinking about how to make your dog looks like a Teddy bear with this style, you are correct. For teddy bear style, you trim the hair on the heads a bit shorter than the rest of the body. In fact, you can choose the length you like, and it still does not affect the style. This style looks best on breeds that have curly fur. When you trim the fur short, your dog looks fluffy and similar to a Teddy bear. Some breeds with curly fur are poodle, pumi dog, spaniel, and so on. If the Teddy bear style resembles a teddy bear, lion cut resembles a lion’s mane. Such a self-explanatory name, isn’t it? To do this style, we do the opposite to the Teddy Bear style. First, you trim the fur normally, but leave the hair on the neck and head longer than the hair on the body. For the body hair, you can trim as short as you want, and the shorter it is, the more different it becomes compared to the neck and head; and thus, the style looks more apparent. 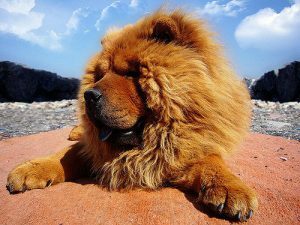 Although this style is not specific to any dogs, some certain breeds look so much better with the Lion cut. For example, Pomeranians or Chows naturally have leonine looks that make them most suitable for Lion Cut. Since Pomeranians are known to be the most gorgeous in the lion look, this style is also sometimes called the “Pom” cut. For the top-knot, a part of the hair on the head is tied with a band of a clip, resembling a ponytail. 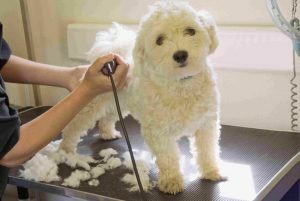 The rest of the body can be trimmed at any length, depending on the dog owner’s preference. This is also one of the simplest styles for DIY groomers because it does not take too much time, and the trimming part is also simple. Since the hair on the head is tied, you may have guessed that this is a hairstyle for long-haired breeds such as Shih Tzu or Maltese. If you have any long-haired dog, you can try this top-knot style as something new for your dog other than the ordinary cut. Keep in mind that these dogs naturally have long hair to protect them from external harms, so do not cut the hair too short or it may harm them. There are various hairstyles that you can do for your four-legged friends. The 5 hairstyles discussed above are commonly used ones for various breeds. Although creating a hairstyle for your dog is fun, and new hairstyle makes your dog look more adorable, choosing an appropriate hairstyle relies a lot on the dog’s breed. For instance, some breeds such as double-coated breeds are not suitable for styles that require lots of shaving. In addition, shorter is not always better. Some long-haired breeds are meant to have long-hair for better protection, so if you cut it short, it may harm the dog. Therefore, before picking a hairstyle for your dog, it is crucial that you understand your dog’s breed and its hair characteristics so that you can make the best decision. Another note is that once you give your dog a hairstyle, you are not required to maintain it all the time. It is important to do regular grooming for your dog, but it is not necessary to always give your dog a certain hairstyle every time. It is normal to go back to an ordinary neat style anytime. We hope that you succeed in creating awesome hairstyles for your dog, and enjoy a good time together.